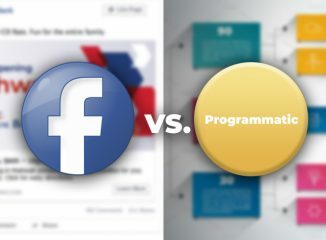 Technology and Marketing Strategy: Is Programmatic or Facebook best for you? Two great platforms warrant comparisons. With new platforms in the marketing world, technology and marketing strategy continue to work hand-in-hand. It’s important to choose the right digital marketing tools for the right reasons. Though programmatic is now reaching sites all across the web and popularity is growing every year, seasoned marketers often prefer Facebook. More times than not Facebook delivers lower costs-per-click. Doesn’t require a third-party platform license fee. Frequently, results are seen faster. Far more impressions and lower costs-per-impressions. Ability to reach potential customers at the top of the sales funnel. “Follows” potential customers while they browse multiple sites. By working with an agency on technology-based marketing, you can test more than one digital platform and compare data-driven results, optimizing across and within platforms for the best success. What better way to choose the right digital marketing strategy?